Notice We do not necessarily endorse or promote the information contained in press releases or articles submitted at www.computerdjsummit.com or www.cpsdj.com..
Once again the C.P.S. Awards presentation started off the Computer DJ/VJ/KJ Summit. Hosted by the C.P.S. Educational Department, the C.P.S. community recognized several individuals in attendance for outstanding industry contributions, industry service, and talent with the prestigious C.P.S. Awards. The presentation was made at the beautiful grounds of Sheraton Suites Tampa prior to the first scheduled seminar of the 2007 DJ Summit, attended by industry professionals who enthusiastically supported their colleagues in recognition of their success and accomplishments. 2007 C.P.S. Industry Star Award presented to Brian Durio, owner of Rock Around the Clock Entertainment. Mr. Durio was recognized for his continued industry contributions within the C.P.S. community. 2007 C.P.S. Industry Star Award presented to Bob Moore, owner of Bob Moore Entertainment. Mr. Moore was recognized for his continued industry contributions within the C.P.S. community. 2007 C.P.S. Industry Star Award presented to Lee Fritcher, owner of Dynamic Sounds Entertainment. Mr. Fritcher was recognized for his continued industry contributions within the C.P.S. community. The 2007 C.P.S. Pioneering Award was presented to Jorgen Hedberg, co-owner of Gizmolabs development team. As a software programmer and club DJ Jorgen combined these talants to eventually develope several CPS industry tools.. The 2006 C.P.S. Pioneering Award was presented to Dr. Drax, current President of the American Disc Jockey Association (ADJA) and long time computer DJ activist, advocate, and educator. 2006 C.P.S. Karaoke Pioneer Award was presented to Mr. Gai Marcos—If you’re remotely familiar with Karaoke over the years, in one way or another you have utilized technology developed by this industry pioneer. With a Bachelor of Technology degree, Gai Marcos developed and first introduced the now-popular and industry standard format MP3+G in early 1998. He also developed the first PC Karaoke player to support the format called "WinCDG." 2007 Manufacturers Representative of the Year Award was presented to Jim Moore of Stanton and Cerwin-Vega, who was recognized for his professionalism. This award recognizes the importance of manufacturers’ representatives in the success of our industry. 2006 Manufacturers Representative of the Year Award was presented to Silvio Zeppieri of Denon DJ, who embodies the elements of ethics, equity, excellence, and professionalism. 2006 KJ Singing Championship Award was presented to KJ Diane Calo of Orlando, Florida. She sang an excellent rendition of one of Cher’s popular tunes, and the panel of industry judges and a room full of DJs, KJs, and VJs from across the nation scored her performance as the best during the 2006 TriceraSoft-sponsored event. C.P.S. Educational Department, organizers of the C.P.S. 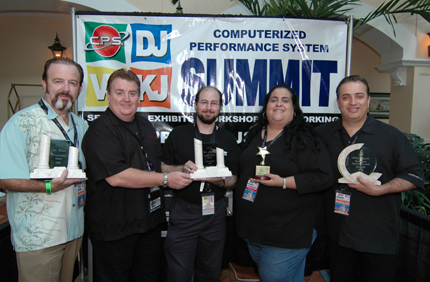 Awards program, proudly recognized individuals and organizations for their extraordinary contributions to the computer DJ/VJ/KJ industry during the 2006 CPS DJ Summit while also reflecting upon and celebrating the 100th birthday of the DJ industry.